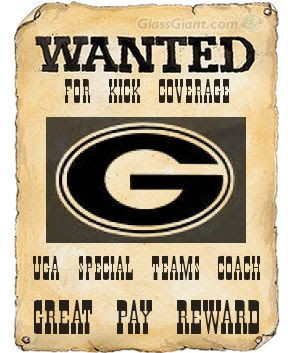 The University of Georgia desperately needs a FULL-TIME special teams coach. We do not need a special teams coach who doubles as a position coach. We need a coach whose only focus is to improve special teams play at the University of Georgia. We need a coach who is tough, aggressive, and enthusiastic. We need an individual who will not accept inept special teams play. And we need him as soon as possible (a summer a year ago would have been nice!). Does this need to be entered in the form of a Christmas wish? A birthday present? It might be in the form of saving someone else higher up a job one day (I'm just sayin'...). It can't be a money issue for one of the most fiscally sound athletic programs in the country. If it is, we'll just raise the money from the Bulldawg Nation. Paul Westerdawg will help get the word out. So will Bernie, as well as Catfish and Cornbread. The Senator too, and Bubba and Earl. Not to mention Dawgxile, and Mackie! And of course, Kit at Dawg-Gone. Perhaps we can get David in on it. And there are many others, just check the rest of my Georgia links. As well as Bulldawg sufferers everywhere. This can get done. This must get done. We're dying a slow death here.